Exciting stuff; fans everywhere will be eager to read Tolkien’s poem on the British legend which was one of his inspirations to create his own mythic saga. Read the details here; thanks to David for sending us the update! UPDATE – we now also have the official press release from Houghton Mifflin Harcourt, about the US release of this work. It follows after the break! Houghton Mifflin Harcourt has acquired the U.S. rights to publish a previously unknown work by J.R.R. Tolkien. Presented for the first time, the tale of The Fall of Arthur will transport readers to a time when the legendary King Arthur ruled Britain, and a dark and mythic world of ancient Europe, when the threat to the kingdom came from both without and within. The Fall of Arthur, begun by J.R.R. Tolkien just a few years before The Hobbit, was inspired by tales of the iconic British hero contained within the work of Geoffrey of Monmouth, Thomas Malory and other English poets, but depicts drama and adventure in language only Tolkien could have written. 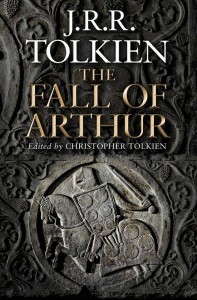 It comprises a work of narrative verse telling of the last days of the King, which has been edited by Christopher Tolkien, who also provides detailed commentary and notes. This is the first new book by J.R.R. Tolkien since the internationally bestselling The Legend of Sigurd and Gudrún in 2009. Houghton Mifflin Harcourt will publish The Fall of Arthur in hardcover in May 2013.